Glamping is one of the best romantic Valentine's getaways for couples and young families. Most of our accommodations are great fun for a glamping break during February, to keep the chill out we provide electric stove-effect heaters inside our Stargazer Yurts, our Country Kabin and our glamping Dome during the chillier months of the year! This year Valentine's breaks are provided with a complimentary bottle of champagne so you can celebrate special evenings with loved ones. Our Stargazer Yurts make a cosy getaway at all times of year, and we can provide many home comforts by request. Our Yurts come complete with a double bed, two single futon sofabeds, electric "stove" heater, electric lights & sockets and a hamper containing cutlery & crockery. Outside there is a fire pit, a barbecue and a two-burner gas stove. 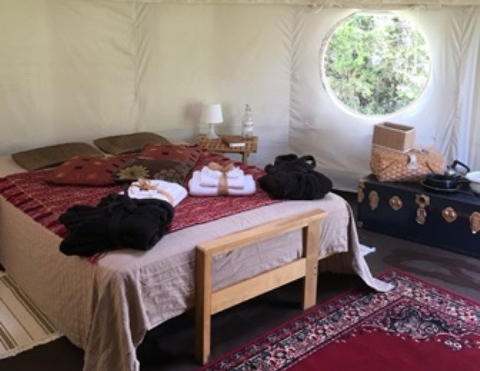 Our glamping Dome is the most luxurious of our glamping accommodations, featuring elegant modern interior design and fixtures, full bedding and towels can be supplied by request. 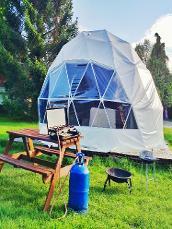 The glamping Dome has a double bed, two futons, electric lights, sockets & electric "stove" heater for warmth & glow. To complete the hotel-under-canvas experience, our Geodesic Dome also comes complete with a Nespresso coffeemaker and pods on arrival. Our glamping Cabin is quintessentially Dorset, right down to the Thomas Hardy novels on your nightstand. The lounge area features a sofabed, gas stove heater and TV/DVD, as well as electric sockets & lights. Through the "secret" bookcase door lies the master bedroom, which features a double bed, chairs and an electric faux-stove heater to provide a flickering ambience during the winter nights. We offer specially tailored two & three night glamping packages for Valentine's Day, two nights in a Stargazer glamping Yurt or our glamping Country Kabin including champagne is £210, and 3 nights is £300. A Valentine's getaway in our glamping Dome is £225 for 2 nights or £310 for a three night stay. Additional items can be supplied by request, please visit our Glamping Services page for full details. One night glamping breaks are available, supplements apply. Complimentary champagne for stays of 2 nights or more staying on the 14th of February.